The main benefit of lawn spreaders is that they ensure an even application of granulated lawn products, which is essential if you want a perfectly healthy and flourishing lawn. Without the help of a spreader, lawn seed is commonly laid in a haphazard manner, which can result in a patchy lawn with some areas being dense where others have a definite lack of lawn growth. Uneven fertilizer spreading can also cause problems, particularly if it is spread too heavily, where it will cause burning of your lawn. There are many types of spreader available, including manual, handheld, push along, and tow behind options. 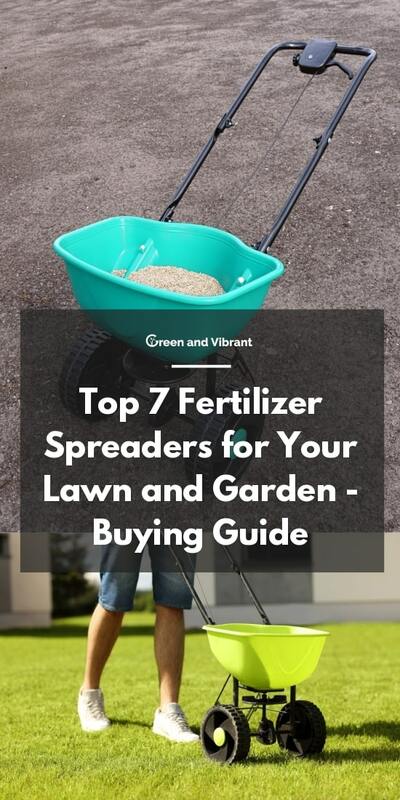 I have reviewed a selection of the top rated spreading products to help you decide which are the best fertilizer spreaders for your lawn and garden. Looking for a fertilizer spreader for your piece of land? Here’s what you should know. Anyone who has tried to manually disperse fertilizer across their lawn by simply scattering or throwing it will know that the distribution is far from even, and can result in patchy looking grass and even fertilizer burn. Spreaders eliminate this issue by evenly distributing any granular lawn products. Another big advantage spreaders provide is efficiency. Why would anyone choose to manually fertilize or seed their lawn in an inaccurate way when a spreader can complete the job to a much better standard in a fraction of the time? Lawn spreaders, whether you opt for a handheld, push along, or tow-behind product will significantly cut down the time you spend laying product on your lawn. They are easy to use, effective at even spreading, and will give you the best results for your lawn and garden. There are three main categories that lawn spreaders fall into. These are handheld spreaders, push along spreaders, and tow-behind spreaders. All have various pros and cons depending on what you are looking for in your spreader. These are best suited to smaller yards where buying a larger piece of equipment would be simply unnecessary. They come in entirely manual or battery-powered varieties and are ideal for anyone with a lack of storage or a smaller budget. These are aimed at those with moderate to large lawns or pieces of land and come with various sized hoppers to accommodate the users differing levels of product needed. They are easy to operate, requiring little effort to seed or fertilizer a lawn in a short space of time. Finding a quality push along is key because many poorly made models will not last longer than a season. Do You Need a Fertilizer Spreader? 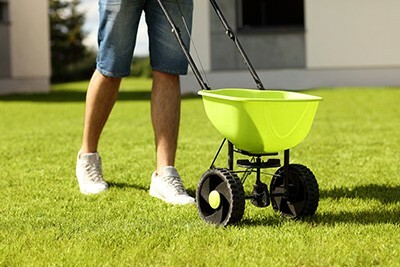 If you are currently fertilizing your lawn by hand, then using a spreader would likely be a much more preferable option. Handheld spreaders can be picked up very inexpensively, and they pay for themselves in what you will save on fertilizer by having it spread in a more effective fashion. Hand spreading can result in product wastage if it is applied too thickly, as well as causing damage to your lawn. Fertilizer spreaders are essential for crop growth. “Research indicates that when one area of the field is over-fertilized and another is under fertilized, the total yield typically will be less than if the correct amount of fertilizer were spread evenly over the entire field” (University of Maryland). What you need in a spreader will depend mostly on your lawn, as well as your own personal preferences for how you like to work in your yard. Small lawns are best suited to handheld spreaders, or mini push along spreaders. Handheld spreaders are favored by many users because they are so simple to use and take no time at all to prepare. There’s no assembly required and very little storage space needed. They are usually also the most budget friendly choice of spreader. Battery-powered spreaders may be a better option for anyone who enjoys a more automated style of tool. The manually operated spreaders will appeal to users who prefer to have more personal input. Look for lightweight and ergonomically designed hand held spreaders. which will be comfortable to carry and not induce any stress on your shoulders or back. Balance is also important to ensure that the spreader does not tip once heavy product is loaded into it. Medium to large sized lawns may also appreciate hand held spreaders, though it will obviously take slightly longer to complete the spreading, and may require several top ups of product because a handheld spreader can only comfortably carry so much. Some users with larger gardens prefer a push along spreader, where a large hopper with no need to refill is a benefit. If you like the sound of a push along spreader, look for a solidly built model that will not buckle under pressure or fall apart after a few uses. A lightweight option will also make spreading more enjoyable, but weight should not be prioritized over quality or sturdiness. For anyone with an acre or more of land, a tow-behind spreader will likely be the obvious choice. Look for a quality build that will stand the test of time because they can be quite an investment in terms of cost. Choose a tow-behind spreader with a hopper that has a capacity in line with the size of your land. Check that the connector that will adjoin the spreader to your tractor or mower will fit. And, probably most importantly, reflect on user reviews of a product before you purchase it. The type of spreader you choose will affect how you use it, though you should always follow a single directional pattern, such as east to west, continuing in striped lengths until all of the area is covered. This is unless the manual of the spreader dictates otherwise. Be sure not to overlap your lengths, and take care around edges. There are a variety of models available, but whichever type you’re looking for, these are the best you can get. The Top 7 Fertilizer Spreaders - How Do They Compare? The Brinly BS36BH Tow Behind Broadcast Spreader has a larger capacity hopper than its rival, the Agri-Fab 45-0463 Tow Behind Broadcast Spreader. It can hold 175 lbs of product compared with Agri-Fab’s 130 lbs. The Brinly tow behind outperformed the Agri-Fab tow behind in user reviews with the Brinly benefitting from superior assembly instructions and a straightforward build compared with Agri-Fab’s inferior assembly instructions which resulted in a lengthy and frustrating build for many. The Brinly struggles on rough terrain or steep inclines compared with the Agri-Fab, which benefits from a wide wheelbase and pneumatic tires to increase stability on uneven ground. The Titan Professional Broadcast Spreader is comparable to the Scotts Turf Builder Pro EdgeGuard Deluxe Broadcast Spreader and its smaller brother, the Scotts Turf Builder EdgeGuard Mini Broadcast Spreader. The Titan has the advantage of a steel frame, making for a sturdy build, compared to the Scotts spreaders, which users found to be poorly constructed. The Titan model has an adjustable handle while the Scotts spreaders feature EdgeGuard technology for precision around the perimeter of lawns. The Scotts Wizz Hand-Held Spreader and the Earthway 2750 Hand-Operated Bag Spreader/Seeder are two of the most popular handheld spreaders available. The Scotts model is held by your side like a suitcase while the Earthway spreader hangs over your shoulder like a bag. The Scotts handheld spreader is battery operated compared with the Earthway spreader, which works by manually rotating a lever. Both spreaders are lightweight, weighing a little over 2 lbs, and both, according to users, have an impressively even spreading pattern. This push along broadcast spreader by Scotts is useful for evenly spreading seed or fertilizer on large lawns, usually of around 5,000 sq ft in size and above. The substantial hopper holds up to 15,000 sq ft of lawn product, reducing the amount of time you will have to spend refilling the hopper. This spreader will work with any granulated substance, including grass seed, fertilizer, and even salt to melt ice and snow on driveways. It comes fully assembled and pre-calibrated so you can get straight to work with no unnecessary time wasted. Scotts promises more even coverage with this spreader, thanks to the control panel which allows you to precisely set the rate at which your product is released. The EdgeGuard technology prevents any product from getting spread onto non-lawn areas by blocking off the right side of the spreader when this feature is in use. Users of this broadcast spreader are impressed with how lightweight and easy to push it is. 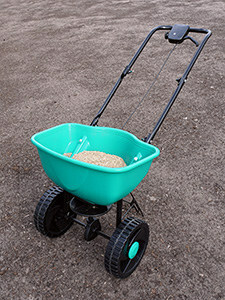 Many users complained about the hollow wheels on the spreader, which filled up with product during use and crumbled out in lumps, causing problems on the lawn. Some users felt the spreader worked efficiently while others commented that it was poorly made. This tow behind spreader has a hopper capacity of 130 lbs, which will cover around half an acre of land before needing to be refilled. The hopper is rustproof. A hopper cover is available to purchase separately to prevent product from spilling out over bumps and to protect product from natural elements. The on-off switch can be activated from the tractor seat, and the gears are enclosed in a box for increased longevity. Adjustment settings mean the user can precisely choose the level of spread required for consistent and even coverage. The wide wheelbase on the spreader and the pneumatic tires help to maintain stability on uneven terrain, and is recommended for lots of land sized one acre and above. Users of this product commented that assembly was particularly tough and instructions inadequate, with assembly frustratingly taking around two to three hours. That being said, users were happy with the build quality and the coverage offered by the spreader. One repeating concern from users was the weak spring on the hopper handle, but this was considered to be a minor issue. This extra large spreader is targeted at gardeners with substantial areas of land to cover. The hopper holds up to 175 lbs of product, giving it the ability to spread over at least one acre of land without needing to be refilled. Fitted with a universal hook, the spreader can be attached onto the back of any tractor or ride-on mower, and towed behind. The patented Directional Spread feature ensures an even spread coverage with extra wide patterns spreading at maximum widths, reducing the amount of lengths you need to drive. Suitable for use in all seasons, this proudly American made spreader can be used with any granular product, including fertilizer, lawn seed, lime, salt, and ice melting agents. At 47 lbs, this is a solid piece of equipment with a fully enclosed gearbox to avoid corrosion and stand the test of time. Users of this spreader were most impressed with the solid build and quality workmanship. They were confident that it would last many years and were generally happy with the spreading coverage achieved. The majority of users were pleasantly surprised with the easy to understand assembly instructions, with product assembly taking around an hour on average. The large capacity and sturdy build of this tow-along spreader meant that most users would happily recommend this product. This push along spreader features an adjustable handle for varying heights and positions to suit any user and minimize back or shoulder pain. With a 50 lb capacity drum, the spreader gives even coverage of seed, fertilizer, ice melt, insecticide, and herbicides. Constructed mainly of steel, this sturdy spreader is almost indestructible, with a high-quality gearbox and durable axle. The 13-inch tires make this spreader easy to push, giving the user the ability to complete lawn product spreading efficiently. The tires are wide and filled with air, which makes them much gentler on soft surfaces than some other spreaders that can leave unsightly wheel marks on lawns. 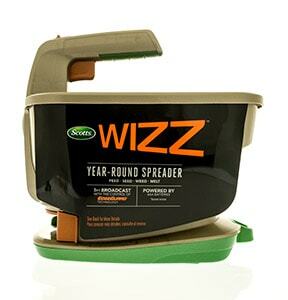 Users of this spreader love how durable it is, and how even the spread coverage is. They were also impressed with the included hopper cover, which protects product from troublesome weather. Users of this product overwhelmingly agreed that the assembly instructions were impossible to follow, making assembly very difficult. It is recommended that anyone purchasing this spreader look online for tutorial assembly videos to help the build process. This product is Scotts smallest walk behind spreader, designed to make spreading lawn products quick and easy for even smaller yards. Able to hold up to 5,000 sq ft of granulated products, this spreader is ideal for anyone who has a compact yard but still wants precise and even coverage. It also works well for spreading ice melt on paths and driveways. Featuring exclusive EdgeGuard technology, the right side of the spreader is obstructed to prevent products from reaching non-lawn areas where they are not wanted. The control panel also helps to ensure coverage accuracy. Some users of this spreader were disappointed with the build quality, commenting that it was manufactured with insubstantial materials and that they would not be expected to last very long. Some users also noted that although the spreader was lightweight and easy to push, the light frame and the angle of it meant that it easily tipped over. Users were happy with the EdgeGuard technology, though noticed that it was more difficult to operate than the larger versions of this Scotts spreader. This battery powered handheld spreader is designed to cover areas of up to 2,500 sq ft. It has a five-foot spreading range and benefits from EdgeGuard technology, allowing you to shut off one side of the spreader to prevent lawn products from getting onto paths or flower beds. Suitable for year-round use, this spreader is compatible with fertilizer, lawn seed, pesticide, and snow melt. At 2.1 lbs, this lightweight spreader is easy to carry and makes quick work of a previously grueling task. Users love the simplicity of this spreader and how well the design has been executed. Users commented that they experienced no clogging of product. They said the spreader was easy to hold and carry and that all of the features worked as they should. Some users were also impressed that 3AA batteries were included and pre-installed with the purchase, though noted that rechargeable batteries would have been preferable. Some users believed that this was a good compromise between a manually operated hand-held spreader, which can be too much physical work, and a walk behind spreader, which can be overkill for a smaller property. Users reported that this product spread evenly and effortlessly. This spreader is worn as a shoulder bag and manually operated by spinning a rotating lever. Clumping is prevented due to an oscillating shut off plate while the gearbox ensures smooth and even spread. Able to hold up to 25 lbs of product, the bag features a zip closure and a molded base. The adjustable shoulder strap allows the length to be customized to fit any user. Users of this product generally agree that it does its job well. Product doesn’t clog, seed is spread evenly, and it is easy to operate. Some users claimed that it was the best spreader they had ever tried, appreciating the ability to spread at your own pace with the height from the ground increasing the distance that seed could travel before hitting the ground. Several users did experience a poorly designed shoulder strap, which broke after only a few uses. They found this disappointing because the other components of the spreader worked so well. For anyone with a considerably larger piece of land, the Scotts Turf Builder Pro EdgeGuard Deluxe Broadcast Spreader and the Agri-Fab 45-0463 Tow Behind Broadcast Spreaderare great buys, both being solid, sturdy, and expected to last for many years. If you're looking for a small portable fertilizer spreader, the standout spreader has to be the Scotts Wizz Hand-Held Spreader due to its even spreading and being practically effortless for the user to operate. This spreader will be suitable for the majority of gardeners’ needs, able to cover up to 2,500 square feet before needing to be refilled with product. Being small and light, it is easy to store, and, aside from making sure you have charge left in your batteries, it requires no assembly and no setup time or preparation.